Katnissssssssss. Katniss Everdeen? Helllloooooo? I am here to see you. And, what? Yes. I am a little drunk, but I thought that would be cool? I thought I’d have some wine and then we could shoot some fighter bomber spy plane things out of the sky with arrows? Jeez. Lighten up. It’s only a movie. And it’s only part 3a of a movie, at that. 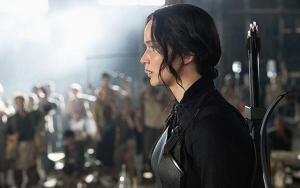 The Hunger Games: Mockingjay, Part 1, if you want to be official, which I don’t. Nor, honestly, do I particularly wish to review this film, which I have just seen, while growing increasingly intoxicated. On purpose. Here’s what happened in the movie: a lot of stuff. Here’s what I cared about: Jennifer Lawrence, doing that thing she does where she makes you cry at things that are mentally deficient but somehow, when she does them, still very weepy making. Very weepy making, indeed. And then some stuff blew up and there wasn’t enough Woody Harrelson and Donald Sutherland ran around licking all the windows and someone get that cat out of here. Is that 500 words yet? Christ. What else can I say? 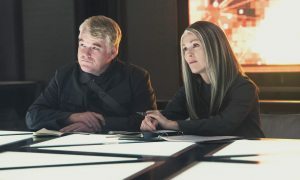 Mockingjay was the least filmable of all the Hunger Games books to begin with and so it’s no surprise that they decided to stretch it out into two films, so that our confusion and disappointment might be elongated. Yes, all sorts of things happen in this movie, few of which have anything to do with anything. There is no real drama; no purpose driving the picture. Part of it is sort of about Katniss struggling against/coming to terms with being a propaganda tool, and that’s exactly as fascinating as it sounds. Part of it is about rescuing poor Peeta, whom I suppose some of you might have some affection for, even though to me he’s always been as endearing as a soap milkshake. Then part of it is about seeing Philip Seymour Hoffman squander one of his last performances in a film about a soapy milkshake and a cat. What do you mean that’s only 300 words? Have you people no souls? No mercy? Fine. Uh. Julianne Moore is wasted on a character with no charisma. Geoffrey Wright doesn’t seem to forget any of his lines that I noticed when I wasn’t busy buying another beer. 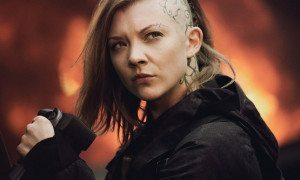 Natalie Dormer has a nice mouth and bad head tattoos. Jena Malone and Stanley Tucci barely appear and there is not a single frame of Toby Jones. In general, I felt the film looked overly dark and the effects unimpressive. Also, I had some liquid refreshments that were alcoholic. What? I just felt like James Dean in Rebel Without a Cause for a moment. It’s Sal Mineo’s fault, for being not in Hunger Games: Mockingjay, Part 1. Unless he was in it? Subliminally? Good news! That’s 475 words! I only have to write 25 more before I feel like this post is long enough and I can stop pretending I have anything to say. Damn. One word too many.